Projection Artworks is a creative studio and production house specialising in projected art and video-mapping for events, conferences, PR stunts, private parties and experiential activity. This has been a real draw for visitors. People simply have to stop and watch. Following the window display installations, the store recorded its highest sales weekend of the year. Challenge: Projection Artworks was given the challenge from M&M’s World to create two front window pods containing M&M’s bottles and two large M&M’s. 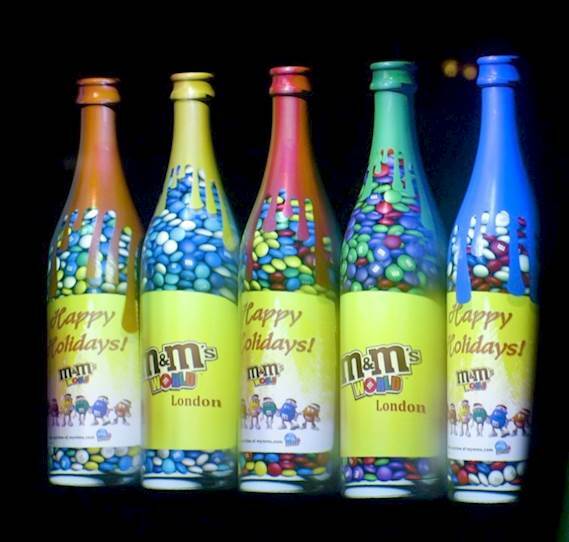 Solution: The bottles and M&M’s were brought to life using animated content created within the Projection Artworks studio, using an Optoma ZU650 WUXGA projector, powered by DisplayMapper software. Results: These window displays grab attention by creating an engaging experience that makes people stop and watch. 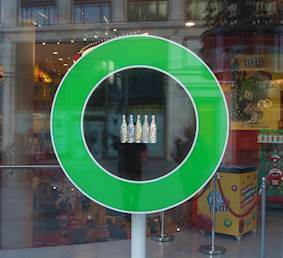 Projection Artworks was given the challenge from M&M’s World to create two front window pods containing M&M’s bottles and two large M&M’s. The installation needed to be daylight-visible and grab attention, while engaging shoppers and promoting the brand. The idea of using pods to digitally promote the brand story ruled out the use of flat screens, with the location needing something that could attract and engage. It was decided to create projection mapped displays to achieve the impact required. Projection mapping allows the content to be wrapped around the physical display items. These pods would need to be very bright to be visible during daylight hours on a south facing window. The bottles and M&M’s were brought to life using animated content created within the Projection Artworks studio, using an Optoma ZU650 WUXGA projector, powered by DisplayMapper software. Display Mapper was ideal for the installation as it allows updates to content to be pushed out “live” within minutes to one pod or all. This can target consumer preferences and product promotions at a local level. With WUXGA resolution and 6,000-lumens, Optoma’s ZU650 laser phosphor projector was chosen for the installation due to its brightness, image quality and reliability. These were built into the pods so they are not visible to the consumer’s eye and use a mirror to reflect the content onto the physical display area. This prevents any interference with the equipment and gives a neat solution for the store. The window displays grab shoppers’ attention by creating an engaging experience that makes people stop and watch.